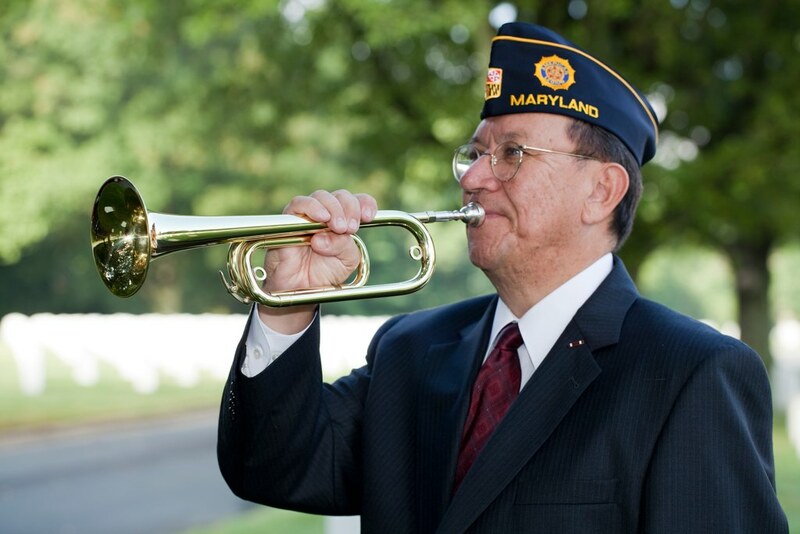 As a bugler, you may be asked to sound Taps at a funeral, memorial service, or wreath-laying ceremony. 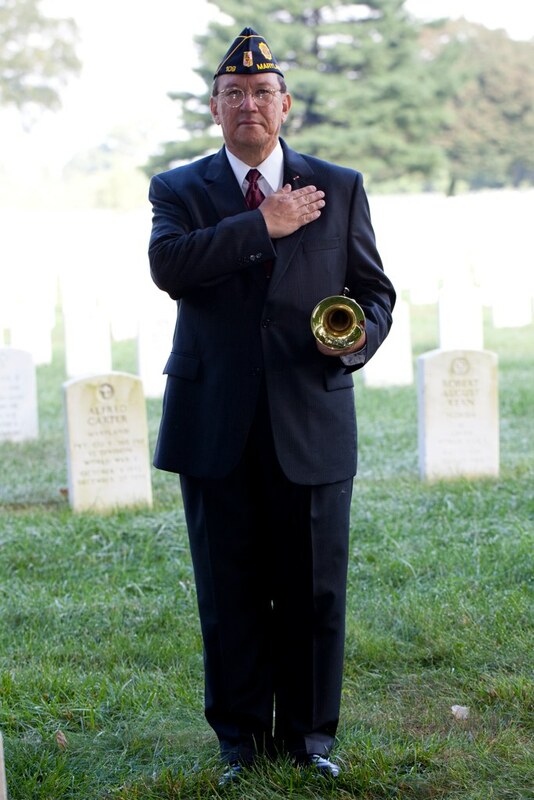 With the number of veterans funerals rising and the number of active-duty military buglers declining, many non-military musicians are asked to perform at the services. The following are guidelines I have written based on the procedures followed by military buglers over many decades. I have modified them to cover those civilian buglers who may be called into service to sound Taps at funerals or memorial services. 2. Bugler is to report promptly to the funeral site at the appropriate time and report to the Officer In Charge (OIC) or Non-Commissioned Officer In Charge (NCOIC). 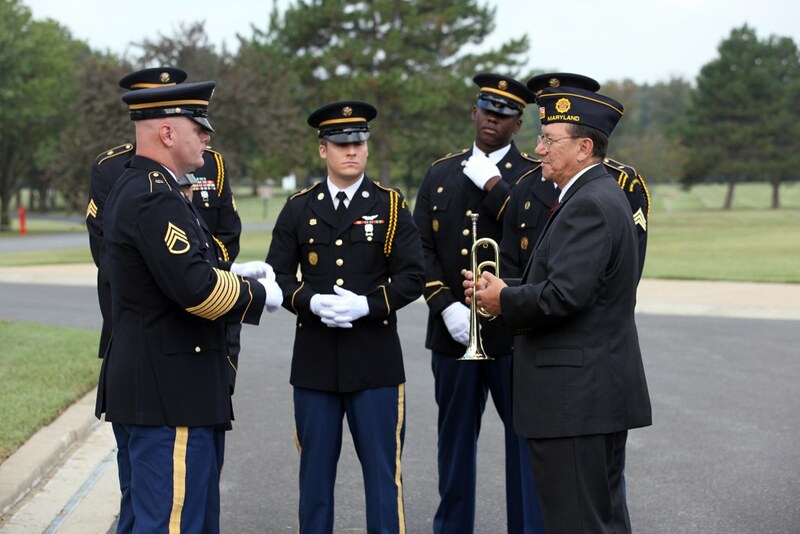 If you are a civilian bugler performing at a military ceremony, always check in with that person to coordinate when Taps is to be sounded. If you arrive at a funeral and there has been a live military bugler assigned, you should stand down unless you have been hired or you are there at the special request of the family. If that happens, confer with the military bugler, funeral director and cemetery administrator to insure everyone understands who is playing. Do not perform “echo” Taps as it is not authorized for military funerals. Checking on this prior to a funeral alleviates duplication of buglers for a service and could free up a bugler to honor another veteran. Bottom line to to follow the wishes of the family. 3. 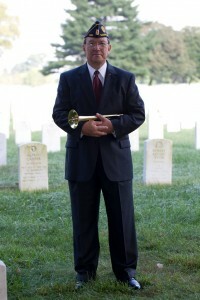 Bugler is to position him/herself near the gravesite, angled from the firing party (ideally the bugler, firing party, and funeral party will form the three points of a triangle). 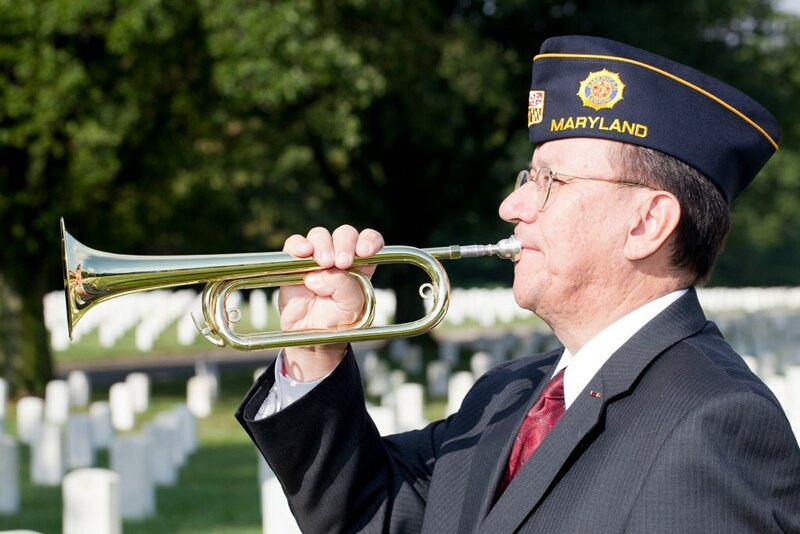 The bugler should take care to stand in a location where the sound will carry to the funeral party and where he/she can be seen. The bell of the instrument should be pointed toward the casket. 4. Bugler will render a Hand Salute as the casket is carried to the gravesite. If you are in civilian dress, place your right hand over your heart. The bugler will stand at ease during the funeral service. 5. When the service is complete, the OIC or NCOIC will Present Arms. The firing party will come to attention and fire three volleys. Bugler will sound Taps after the third volley and after the NCOIC of the firing party executes Present Arms. After sounding Taps, the bugler will render a Hand Salute * (if in civilian dress, place your right hand over your heart) and Order Arms (bring the bugle down to your side as the firing party does with their rifles) on the command of the NCOIC of the firing party. 6. When a firing party is not available, the bugler will sound Taps on completion of the service and at an arranged signal by either the OIC, NCOIC, or officiating person. After sounding Taps, the bugler will render a Hand Salute* and Order Arms on his/her own. A recording of a firing party should not be used. *recent legislation allows for veterans to offer a Hand Salute if not in uniform. 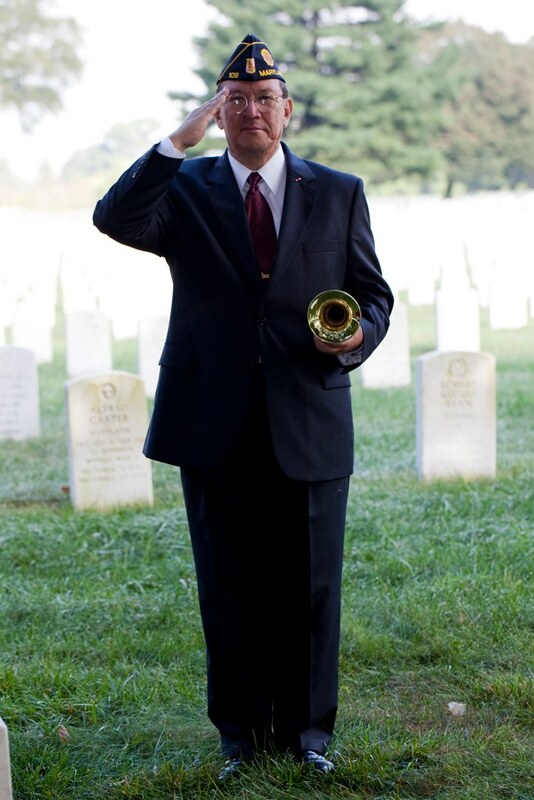 The Army is the only service that still uses bugles (made by Bach Stradivarius) to sound Taps at Arlington National Cemetery. These bugles are based on the regulation 1892 model, but pitched in B flat. The other services use regular B flat valved trumpets except for the U.S. Marine Drum and Bugle Corps (who perform at Standard Honors Funerals at ANC); they use two-valved bugles pitched in G.
Any fee charged should cover the time needed to travel and expenses incurred as part of the performance. Even though Taps takes less than a minute to play, time is needed to find the cemetery, meet with the funeral director or person in charge of the ceremony and drive home. This does not count the time spent in getting information about the funeral and waiting for the funeral party to arrive at the cemetery. Sometimes you may wind up waiting for a few hours if a church service runs long. My advice is to get as much information ahead of time as possible about the time of the service at the church or funeral home, the address of the cemetery, and phone numbers just in case of transportation problems. Finding the cemetery on a map or through a search on the computer is helpful too. Remember – you can be two hours early for Taps but you can’t be two minutes late! 1. The sounding of Taps at ceremonies is the most sacred duty a bugler can perform. Every effort should be made to sound a perfect Taps in keeping with the solemn and impressive occasion of a military ceremony. 2. The call should be sounded with conviction and not rushed. Every effort should be made to perform musically and with good intonation. 3. Careful attention should be paid to the rhythm of the seventh, eighth, tenth, eleventh, thirteenth, and fourteenth notes of Taps to ensure that they are played as straight eighth notes. This entry was posted on Thursday, March 9th, 2017 at 12:49 am	and is filed under Bugle Stories, Buglers Through History, Bugles for Performing and Collecting, General Interest, History of Taps, History of the Bugle, Taps in Recent History, Taps Performance Guidelines. You can follow any responses to this entry through the RSS 2.0 feed. You can leave a response, or trackback from your own site. i have 3 high school band members playing taps for me on 15 dec at 3 local cemeteries. i’ve asked them to wear black pants/shoes, white shirt/gloves and a hat. i said could be a dress one or the smaller flat one. the person who found the musicians said he’s not sure what type of hat to wear. is it required or strongly suggested to wear a hat? i know uniformed personnel have to have a “cover” but what about civilians? we did have army/navy store nearby but it closed. the base does have a uniform store, but expecting them to be more expensive there. what about baseball hat with one of the 5 services? i was hoping to start playing taps myself, but other plans got in the way. Thank you for all of this info. In particular I’m happy to see the info on the rhythm. I’ve known it as straight eighth notes. I counsel the Bugling Merit Badge (Boy Scouts). I teach and insist on straight eighths. It bothers me to hear the dotted eighth/sixteenth. I found your sight because I heard a performance of taps by a Chicago Symphony Orchestra trumpeter playing it wrong, and he’s retired military. Other than the rhythm, it was beautiful. I’m a civilian. I’ve often thought I should offer my services to military funerals. I did play once for a friend’s funeral. It was quite the honor. a) before the volley, or b) after Taps ? Hand over heart in Civilian Clothes.